H. Zheng, L. Dong, A. Sampaolo, P. Patimisco, W. Ma, L. Zhang, W. Yin,L. Xiao, V. Spagnolo, S. Jia, F.K. Tittel, “Overtone resonance enhanced single-tube on-beam quartz enhanced photoacoustic spectrophone”, Appl. Phys. Lett. 109, 111103 (2016). A. Sampaolo, P. Patimisco, M. Giglio, L. Chieco, G. Scamarcio, F.K. Tittel, and V. Spagnolo, “Highly sensitive gas leak detector based on a quartz-enhanced photoacoustic SF6 sensor”, Opt. Ex. 24, 15872-15881 (2016). 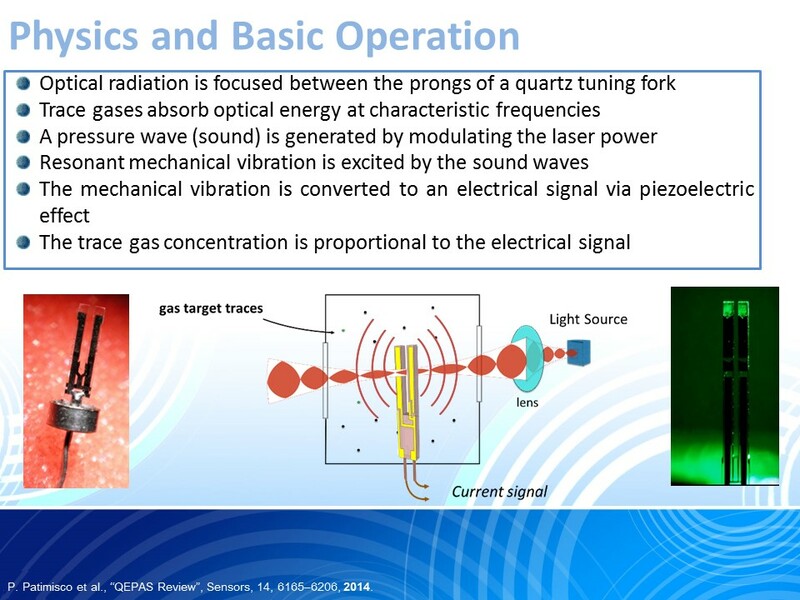 P. Patimisco, A. Sampaolo, L. Dong, M. Giglio, G. Scamarcio, F. K. Tittel, and V. Spagnolo, “Analysis of the electro-elastic properties of custom quartz tuning forks for optoacoustic gas sensing”, Sensors and Actuators B 227, 539-546 (2016). 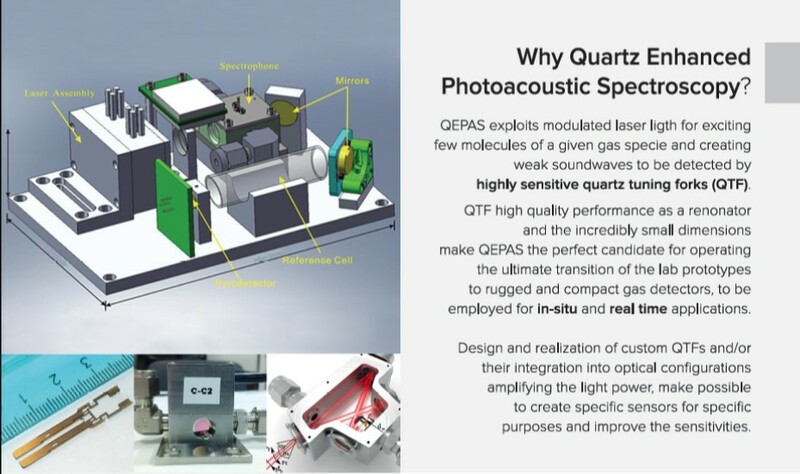 A. Sampaolo, P. Patimisco, L. Dong, A. Geras, G. Scamarcio, T. Starecki, F. K. Tittel, and V. Spagnolo, “Quartz-enhanced photoacoustic spectroscopy exploiting tuning fork overtone modes”, Appl. Phys. Lett. 107, 231102 (2015). P. Patimisco, G. Scamarcio, F.K. 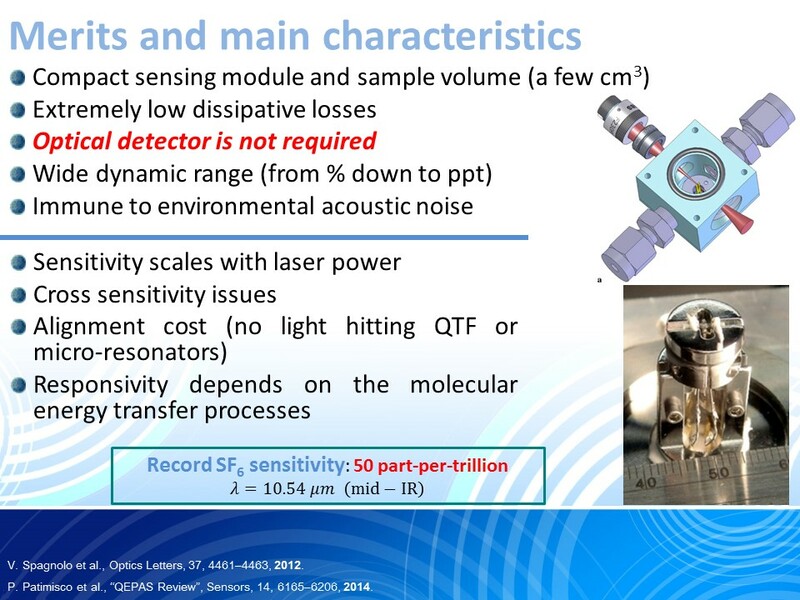 Tittel, V. Spagnolo, “Quartz-Enhanced Photoacoustic Spectroscopy: A Review,” Sensors 14, 6165-6205 (2014). V. Spagnolo, P. Patimisco, S. Borri, G. Scamarcio, B.E. Bernacki, and J. Kriesel,” Part-per-trillion level SF6 detection using a quartz enhanced photoacoustic spectroscopy-based sensor with single-mode fiber-coupled quantum cascade laser excitation,” Opt. Lett. 37, 4461–4463 (2012). S. Borri, P. Patimisco, A. Sampaolo, M.S. Vitiello, H.E. Beere, D.A. Ritchie, G. Scamarcio and V. Spagnolo, “Terahertz quartz enhanced photo-acoustic sensor”, Appl. Phys. Lett. 103, 021105 (2013). S. Borri, P. Patimisco, I. Galli, D. Mazzotti, G. Giusfredi, G. Scamarcio, P. de Natale, V. Spagnolo, “Intracavity Quartz-Enhanced Photoacoustic sensor”, Appl. Phys. Lett. 104, 091114 (2014). L. Dong, V. Spagnolo, R. Lewicki, F.K. Tittel, “Ppb-level detection of nitric oxide using an external cavity quantum cascade laser based QEPAS sensor”, Opt. Ex., 19, 24037-24045 (2011). M. Jahjah, W. Kiang, N.P. Sanchez, W. Ren, P. Patimisco, V. Spagnolo, S.C. Herndon, R.J. Griffin, F.K. Tittel, “Atmospheric CH4 and N2O measurements near Greater Houtson area landfills using QCL-based QEPAS sensor system during DISCOVERY-AQ 2013”, Opt. Lett. 39, 957 (2014). H. Wu, A. Sampaolo, L. Dong, P. Patimisco, X. Liu, H. Zheng, X. Yin, W. Ma, L. Zhang, W. Yin, V. Spagnolo, S. Jia, and F.K. Tittel, “Quartz enhanced photoacoustic H2S gas sensor based on a fiber-amplifier source and a custom tuning fork with large prong spacing”, Appl. Phys. Lett. 107, 111104 (2015). P. Patimisco, A. Sampaolo, H. Zheng, L. Dong, F.K. Tittel, V. Spagnolo, “Quartz–enhanced photoacoustic spectrophones exploiting custom tuning forks: a review”, Advances in Physics X 2, 169-187 (2016). H. Wu, X. Yin, L. Dong, K. Pei, A. Sampaolo, P. Patimisco, H. Zheng, W. Ma, L. Zhang, W. Yin, L. Xiao, V. Spagnolo, S. Jia, and Frank K. Tittel, “Simultaneous dual-gas QEPAS detection based on a fundamental and overtone combined vibration of quartz tuning fork”, Appl. Phys. Lett. 110, 121104 (2017).